Yeah, I know this post is about 9 days late, which is a lifetime in politics. Oh well. I blame my daughter’s birth for the delay. 😉 I had it all written up before, so I may as well publish it. In the first debate between Romney and Obama last week, Romney walked out with a historic win. A Gallup poll asking viewers who they thought did better granted Romney a higher margin of victory than has ever been recorded in the history of the survey. Obama was underprepared and unfocused. 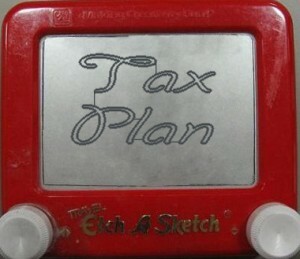 But I want to explore another factor that hurt him deeply: he forgot about Romney’s Etch-A-Sketch. Obama apparently expected to debate the same Romney that fought through the Republican primaries earlier this year. The Romney that’s been out campaigning and trying to rally the GOP base by throwing out red meat. The Romney that has been called inept, ineffective, inauthentic, and milquetoast by frustrated pundits in his own party. But that wasn’t the Romney that showed up to debate Obama. This Romney was a moderate, pragmatic conservative. One who for the most part understood give-and-take, compromise, and the practical limitations of ideology. One who knew how to triangulate on the issues as well as Bill Clinton. You know, good ol’ “moderate Mitt”, as Clinton put it. The guy who ran for Senate in 1994. The guy who was a governor in Massachusetts. Obama’s attack lines seemed to target a version of Romney that was more extreme than the one sharing the stage with him. It was obvious he wasn’t prepared for what happened. He seemed to catch the discrepancy early into the debate, I think, when he was sardonically summarizing Romney’s tax plan as a “big, bold idea” that was a central tenet in his campaign for 18 months but that was apparently being discarding 5 weeks before the election. Overall, though, Obama was unable to shift gears or adjust his approach enough, and as a result, many of his attacks or defenses fell flat. Much to the surprise of many observers, when Romney doesn’t try to present himself as a “severely conservative” culture warrior, he can actually come off—get this—as “likeable”. “Authentic”, even. Judging by the post-debate reactions of pundits across the political spectrum, it was an amazingly unexpected (and effective) transformation. The fact checkers weren’t terribly impressed with him, but after all, the know-it-all candidate is never the one with whom voters would rather have a beer.